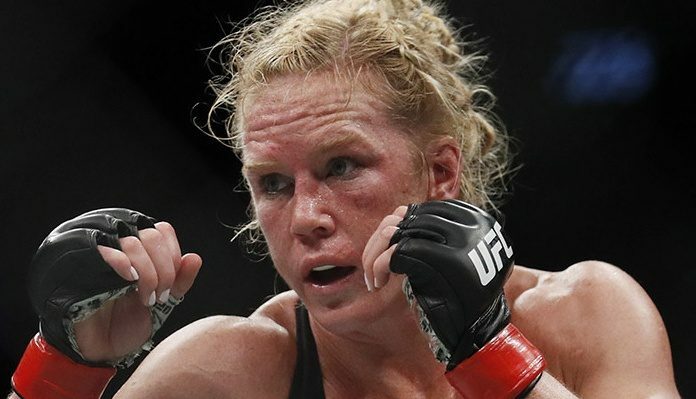 Former UFC bantamweight champion and two-time UFC featherweight title challenger Holly Holm is set to return to the cage at UFC 235, where she’ll battle red-hot prospect Aspen Ladd. If Holm wins this fight, she’ll be one of the frontrunners for a shot at Amanda Nunes — whether it’s for Nunes’ bantamweight or featherweight belt. Having watched Amanda Nunes unseat Cris Cyborg in December, and battled Cris Cyborg herself, Holly Holm as some interesting perspective on a fight with Amanda Nunes. “It just shows how styles make a difference,” she said. “So Amanda can’t look at a fight with Cyborg and say, ‘Well, I beat Cyborg, and Cyborg beat Holly, so I can beat Holly.’ It’s just styles make a difference. You look at the fight with [Valentina] Shevchenko and Nunes. It was more of a battle, more of a death match, more of a game like that. And Nunes had a hard time with Shevchenko, who is now a 125-pound champ, but she was able to knock out a 145-pound champ. You look at there’s a 20-pound difference in between that and when they fought at 135 it was just a whole other game. How do you think Holly Holm would fair against Amanda Nunes? This article first appeared on BJPENN.COM on 1/23/2019.